DAY REVIEW: Two of Sunday's three Men's EHF Cup matches ended in double-digit victories for the home teams, while Füchse got a useful away win. It was a day of the clear wins in the Men's EHF Cup Sunday. Actually, Füchse Berlin's 31:26 away win against GOG was the narrowest victory as Magdeburg won by 18 goals against Maccabi Tel Aviv, and Granollers defeated Porto by 11. Füchse are sure to finish on one of the two top positions in the section after their fourth straight win in the group phase. GOG had left back Andreas Holst Jensen in their team for the first time since he tore his anterior cruciate ligament in the Danish championship semi-final against Holstebro last season. However, his comeback was far from enough for the Danish team. The 3766 spectators saw a first half that was quite level, with both teams taking one-goal leads. Approaching half-time, Füchse created a three-goal lead, which they increased to four at the beginning of the second half. GOG came back to one (18:17) but Füchse soon ran away again, building a 28:20 lead shortly before the end. Left back Petar Nenadic scored 10 goals for Füchse, while left back Lasse Møller and Norwegian centre back Göran Johannessen scored five each for GOG. Granollers doubled their number of points as they made up for their 23:22 defeat away to Porto a week ago in style. Apart from being down 1:0, the home team were in the lead all the way, and after being two goals up for several minutes, the Spanish side increased their lead to six at half-time. In the second half, Granollers continued to increase the distance, having their largest lead at 13 goals a couple of times. 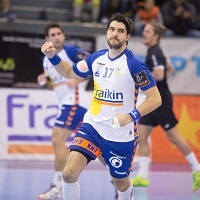 Centre back Marc Canellas, younger brother of Spanish international Joan Canellas from HC Vardar, scored nine goals for Granollers, while four players all scored three for Porto. Granollers are second in the group with four points while Porto remain on two. Last Saturday, Magdeburg won by 16 goals (38:22) away against Maccabi Tel Aviv. But Sunday afternoon in the Bördelandhalle, the Bundesliga team managed an even bigger win as the scoreboard showed an 18-goal difference at the end of the 60 minutes. Tel Aviv scored the first goal in each half, but had no further success. From 1:0 down, Magdeburg went ahead 9:1 and 12:3. And from 17:5 on, their lead was never smaller than 12 goals. In the second half, the home team increased their lead to 21 goals but the visitors were allowed to score the last three goals of the match. Danish line player Jacob Bagersted scored nine goals for Magdeburg, while left wing Gil Pomeranz scored six for Tel Aviv, who lost their last theoretical chance to proceed in the tournament.